On Monday November 24, 2014, Housatonic students gathered in the Lafayette Hall Cafeteria to enjoy a Thanksgiving Luncheon, sponsored by the Student Senate. Stuffing, mashed potatoes, turkey, gravy, rice and beans, salad, and a green bean and carrot vegetable medley were on the menu. There were also sodas and water for beverages, and cookies for dessert. 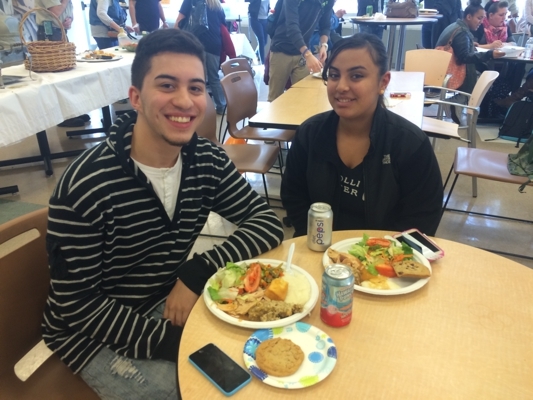 Other students were pleasantly surprised that the Luncheon offered healthy options as well as the fattening (but delicious) turkey and stuffing. Daima Dawkins, who has recently began eating healthier, says, ”It was nice eating with my friends and I’m so happy they had salad and veggies”. 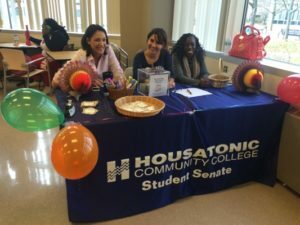 The best part was it was free for all H.C.C. students with a valid I.D., and faculty could participate with a small donation to the Ms. Mary Eady Book award fund. This fund was created by the Black Student Union, but distributed by the Foundation to honor Ms. Eady, a beloved faculty member whom worked at the HCC Woman’s Center up until her passing a few years ago. Students who receive the book award are granted money to aid in purchasing textbooks. As the Thanksgiving holiday approaches, awards and events like these have many people pondering the things in their lives for which they are grateful. 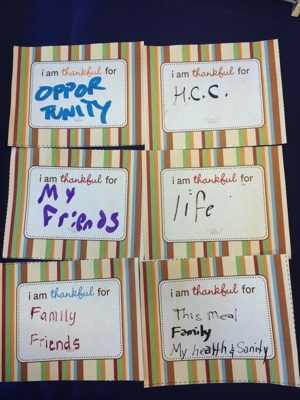 Students and faculty filled out little cards with a word or phrase that came to mind when thinking of blessings. Some responses were: “Opportunity”, “Life”, “This meal”, “Family”, “Friends”, and even “H.C.C.”. With the semester coming to a close, final grades and holidays begin to take a toll on our stress levels. This Thanksgiving, remember to de-stress by reminding yourself of the many things that make your life worth living.